Meeting the Demands of the Universe! What you ask for comes back not in the form you expect, but likely, in the way that you need! You don’t have to agree with this, yet if we look to the Universe the example is there. We cannot exist in this world without some sort of engagement with it. Our very being, our living, is in co-existence with the Universe. We breathe, we eat, we build, we take, we give…this exchange is mandatory. The Universe demands it. So if this is the reality, then our choices lie in how we engage. I don’t have a lot of time nor patience for another list of things I have to do to be ‘good’ or to get what I want or even to think about justifying why I make the choices I do. Yet understanding that resisting the energy of this world is adding to my fatigue, then I have some changes to make. 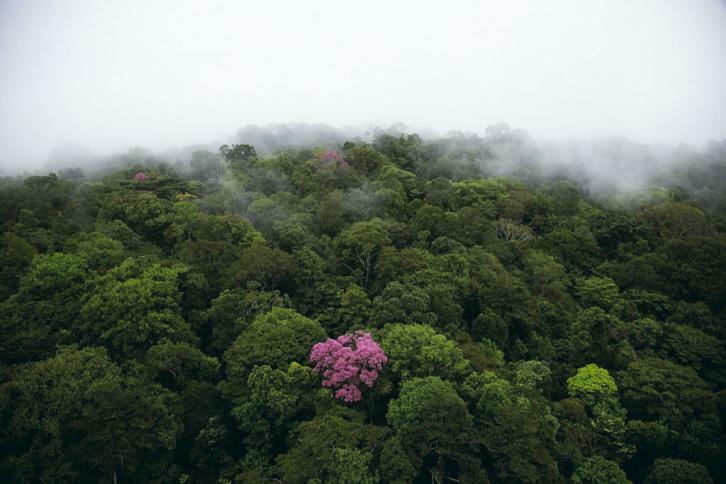 This photo by the renowned Yann Arthus-Bertrand illustrates how the desire to be pink in an all-green world is possible! Ralph Waldo Emerson wrote”Once you make a decision, the Universe conspires to make it happen’. (This is just one reason why he is one of my all time favourite authors!) Physical, spiritual, personal, communal, the energies we expend are received and returned. It is up to each of us to decide how we want participate. I try to choose joy, generousity, humour, love, knowing that grumpiness, anger, fear at times creep in. My spring and summer intentions are going to be mindful of this. Previous post‘stripped down running’ takes off! Hmmmm, love the Emerson, Louise. And you. Attributed to Goethe, but by WH Murray. Engagement with the Universe is the right definition. Universe chooses you or had chosen you long ago and you can’t avoid this “marriage”. Passive marriage doesn’t bring the fruits one expects.